He attended The Doon School from 1956 to 1962, and St. Stephen's College, Delhi from 1962 to 1967. Roy was the National Runner-up in squash in 1964, and participated in three world squash championships representing India. Bunker is a founder of what is now called Barefoot College. After conducting a survey of water supplies in 100 drought prone areas, Roy established the Social Work and Research Center in 1972. Its mission soon changed from a focus on water and irrigation to empowerment and sustainability. The programs focused on siting water pumps near villages and training the local population to maintain them without dependence on outside mechanics, providing training as paramedics for local medical treatment, and on solar power to decrease dependence and time spent on kerosene lighting. He was recognized in 2010 in Time for the programs of the college which have trained more than 3 million people in skills including solar engineers, teachers, midwives, weavers, architects and doctors. Roy was appointed by Rajiv Gandhi to the government's Planning Commission. He recommended that legislation be created that would apply a "code of conduct" for non-governmental organizations. He also proposed that a national council be created that would recommend "legitimate" organizations to the government and monitor their activities. Both of these recommendations were "fiercely" opposed as mechanisms that could be used to promote patronage of favored groups and quell organizations that were not supportive of a particular government or party. In 1983, he was the plaintiff in Roy v State of Rajasthan in which the Supreme Court struck down an emergency policy which had allowed women famine relief workers to be paid less than male workers. Roy has spoken at the TED conference;in which he talks about how the Barefoot College "helps rural communities becomes self-sufficient." Mortenson, Greg. (29 April 2010) Sanjit 'Bunker' Roy The 2010 TIME 100. TIME. Retrieved on 2 June 2012. Jump up to bunker Roy (1 February 2006). Verghese, B. G., ed. Tomorrow's India: Another Tryst with Destiny. Penguin Books India.pp. 347–. ISBN 9780670058631. Retrieved 23 November 2012. Elkington, John; Hartigan, Pamela (1 February 2008). The Power of Unreasonable People: How Social Entrepreneurs Create Markets That Change the World. Harvard Business Press. pp. 52–. ISBN 9781422104064. Retrieved 23 November 2012. Jump up to John, Mary (2003). Children's Rights and Power: Charging Up for a New Century. Jessica Kingsley Publishers. pp. 232–. ISBN 9781853026584. Retrieved 23 November2012. Sumit Ganguly; Larry Diamond; Marc F. Plattner, eds. (13 August 2007). "The Role of Civil Society". The State of India's Democracy. Johns Hopkins University Press. pp. 157–. ISBN 9780801887918. Retrieved 23 November 2012. Epp, Charles R. (15 October 1998). The Rights Revolution: Lawyers, Activists, and Supreme Courts in Comparative Perspective. University of Chicago Press. pp. 253–. ISBN 9780226211619. Retrieved 23 November 2012. TNN (28 October 2012). "'Students untapped forces of social change'". Times of India. Retrieved 23 November 2012. Bunker Roy. 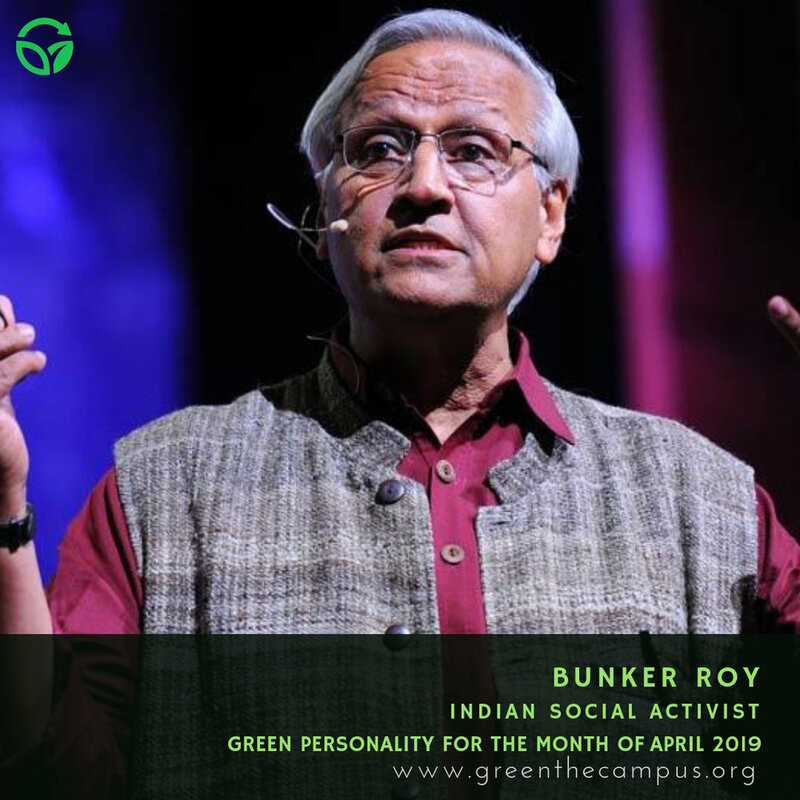 "Bunker Roy: Learning from a barefoot movement". TED. Retrieved 23 November 2012. "Archives – 1985 Science and Technology". Jamnalal Bajaj Foundation. Retrieved 23 November 2012. "Swiss award for Bunker Roy". The Hindu. 22 September 2002. Retrieved 23 November2012. "Memorable Points – National". Pratiyogita Darpan. Pratiyogita Darpan. November 2009. pp. 34–.Retrieved 23 November 2012. If we pollute the air, water and soil that keep us alive and well, and destroy the biodiversity that allows natural systems to function, no amount of money will save us. Suzuki received his Bachelor of Arts degree in biology in 1958 from Amherst College in Massachusetts where he first discovered genetics study, and his Doctor of Philosophy degree in zoology from the University of Chicago in 1961. From 1961 to 1962, Suzuki worked at Oak Ridge National Laboratory. From 1962 to 1963, he was an assistant professor at the University of Alberta. He was a professor in the genetics department at the University of British Columbia for almost forty years, from 1963 until his retirement in 2001, and has since been professor emeritus at a university research institute. Since the mid-1970s, Suzuki has been known for his television and radio series, documentaries and books about nature and the environment. He is best known as host of the popular and long-running CBC Television science program The Nature of Things, seen in over 40 countries. He is also well known for criticizing governments for their lack of action to protect the environment. A longtime activist to reverse global climate change, Suzuki co-founded the David Suzuki Foundation in 1990, to work "to find ways for society to live in balance with the natural world that does sustain us". The Foundation's priorities are: oceans and sustainable fishing, climate change and clean energy, sustainability, and Suzuki's Nature Challenge. The Foundation also works on ways to help protect the oceans from large oil spills such as the oil spill in the Gulf of Mexico. Suzuki has also served as a director of the Canadian Civil Liberties Association from 1982 to 1987. Suzuki was awarded the Right Livelihood Award in 2009. His 2011 book, The Legacy, won the Nautilus Book Award. He is a Companion of the Order of Canada. In 2004, David Suzuki ranked fifth on the list of final nominees in a CBC Television series that asked viewers to select The Greatest Canadian of all time. 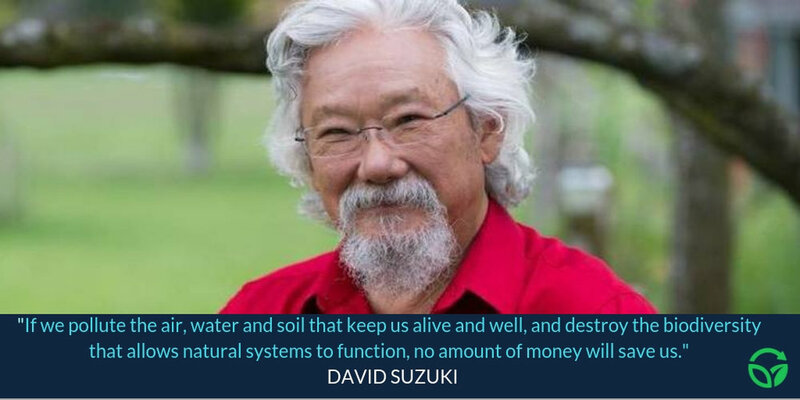 Suzuki is the author of 52 books (nineteen for children), including David Suzuki: The Autobiography, Tree: A Life Story, The Sacred Balance, Genethics, Wisdom of the Elders, Inventing the Future, and the best-selling Looking At Senses a series of children's science books. On the 20th of September, Dr Adenike Akinsemolu honored the invitation from the Microbiology Department of Babcock University, one of the leading universities in Nigeria, where she gave a Seminar presentation titled The Role Of Microorganisms In Achieving the Sustainable Development Goals. During the presentation, she demonstrated to the students how and what a Seminar Presentation should look like, and various strategies to engage and capture the attention of the audience. The presentation lasted for about 30 minutes with the questions and answers session Inclusive. Harmful practices such as arbitrary use of chemicals, increased usage of non-renewable energy sources and uncontrolled generation of industrial waste has posed a great threat to the sustainability of the environment. The way forward is to embrace sustainable measures, cleaner production and green technologies in order to conserve the ecology of the earth for future generations and this is achievable through the 17 Sustainable Development Goals (SDGs) which is sponsored by the United Nations (UN). These goals are divided into five sub-groups namely; People, Planet, Prosperity, Peace and Partnership. Dr Adenike Akinsemolu, in her presentation, defined microorganism as living things that cannot be seen with the ordinary eyes. Microorganism play important roles in green processes and technologies. If microorganisms are used legally and well, they can contribute to the sustainable development goals. The advantages of microorganisms in this context is, in spite of this, often underestimated. The presenter discussed how microorganisms can be deliberately used to play fundamental roles in achieving the SDGs. The usages of some microorganisms in actualizing the SDGs were highlighted at the seminar. Production of Gobar gas, also referred to as Bio-gas, by methane-producing organisms such as Methanomonas, yogurt (using Lactobacillus delbruekii subsp bulgaricus), prebiotics and probiotics (using Lactobacillus acidophilus) and other organisms can be harnessed to achieve the goals under the people sub-group of the SDGs. Botryococcus can store up to 50% of the biomass in the form of long-chain hydrocarbons for the generation of electricity, Eremothecium ashbyii, used in riboflavin fermentation and Pseudomonas as well as Rhizobia used in the production of bio-fertilizers can facilitate the realization of the prosperity sub-group of the SDGs. Microorganisms used in bioremediation and Algae like Saccharomyces or modified Escherichia coli can be used for third-generation biofuel production in actualizing the goals of the planet sub-group of the SDGs. Microbial forensics can be used to trace perpetrators and sources of biohazard in combating bioterrorism while capacity building on trade-related aspects of microbes and microbial technology can help in achieving the goals of peace and partnership sub-groups of the SDGs respectively. Dr Akinsemolu recommends that, to effectually achieve the targets of sustainable development, the most important actions are to be taken by the government through legislations and policies. Government should improve funding for research and development in order to promote micro-based industries. She also recommends that researchers should not only focus on the health benefits of using microorganisms, but also on other significant applications like production of fermented foods, microbial electricity and biocontrol agents among others. The second speaker Mr Kafaru Simileoluwa spoke on the need to rethink the way we make things. He established the fact that Recycling, Reducing, Reuse and Regulating is not enough to solve the present environmental threats faced by the world today; ranging from Climate Change, to pollution and also resource depletion. He stated that the mother earth should not be treated as merely a tool for mans progress, but man should see a need to actively interact with nature in a mutually benefitting manner. He emphasized that there is a need to go back to the very foundation of all products and bring out a design that would interact safely with the environment, a world where the word WASTE only exists as a source of natural resource for man and equally nutrient for the environment. "15 years ago, on 19 august, 22 humanitarian aid workers were killed in a bomb attack on the canal hotel in Baghdad, Iraq. This World Humanitarian Day, we’re shining a light on the millions of people whose lives are being destroyed by wars. Explore their stories, then join the movement to demand action from world leaders. Civilians are #NotATarget." Join us as Dr. Akinsemolu discusses the numerous positive functions microbes perform in the environment and a need to explore the microbial world astutely as it can contribute tremendously to sustainable development. The seminar is open to the general public but limited seats are available. On 28th June, Founder of the Green Institute, Adenike Akinsemolu featured on a TEDx event titled Shaping The Future, where 12 speakers within 12 minutes spoke on various fields of study spanning across agriculture, music, poetry, social and biological environment. Currently, only two percent of all global scientific research comes from Africa. A new scientific journal has been launched in Africa in an effort to increase research output from the continent, which currently provides just two percent of all global research publications. We encourage young African researchers to publish in this new scientific journal. Our ultimate goal is to elevate the dialogue about the challenges of sustainable development as an inclusive approach to solving pressing global problem. We invite experts, academics and students to submit chapter contributions and innovations for collectively addressing the contemporary challenges facing the anthroposphere, in which the environment is a pivotal constituent. He attended Chatsworth Road Primary School, Cheam; Cheam Road Junior School and Sulton County Grammar School; all in England. He originally wanted to study English Literature and History but later changed to study Botany, Physics and Chemistry in the sixth form. Thus he studied Botany for a bachelor degree at Chelsea college of science and Technology which is now part of University College, London. Also, he got his PhD at Bedford College (now part of the University of London) in 1960. In 1960, David Bellamy became a lecturer in Botany Department of Durham University, after having worked as a laboratory assistant at Ewell Technical College, London and before becoming a graduate. However, it was his environmental consultancy work on the Torrey Canyon oil spillage in 1967 that brought him into prominence as a result of his write up in a leading scientific journal named “Nature”. Also, he wrote many books for TV series in the 1980’s, especially for children’s enjoyment and education. In 1980, he released a musical single entitled ‘Brontosaurus Will You Wait For Me?’. It reached number 88 in the charts then. Besides, Bellamy worked for the New Zealand Tourism department’s unique program for foreign journalists. While in New Zealand, he also worked on a documentary series known as “Noah’s Ark” which was released in 1990. Moreover, he is one of the originators of the Ford European Conservation Awards. Significantly, David Bellamy has worked on and presented hundreds of television programs on Botany, ecology, environmental and other issues. Examples of such include “Bellamy on Botany”, “Bellamy Britain”; “Bellamy Europe”; and “Bellamy Backyard Safari”. In 1983, Bellamy was jailed for blockading the Australian Franklin River in a protest against a proposed dam. On the 18th of August, 1984, he jumped from the pier at St. Abbs Harbor into the North Sea and thereby Voluntary Marine Reserve, the St. Abbs and Eyemouth Voluntary Marine Reserve. In the late 1980’s, he staged a campaign in Jersey, Channel Islands, to save Queen Valley from being turned into a reservoir because of the presence of a rare type of snail, but he was unable to stop it. Besides, David Bellamy is the President of the British Institute of Cleaning Service (BICSc) and a strong supporter of the BICSc plan to educate young people to care for and protect the environment. Also, he runs the David Bellamy Awards program as a competition designed to encourage schools to be aware of and act positively towards environmental cleanliness. 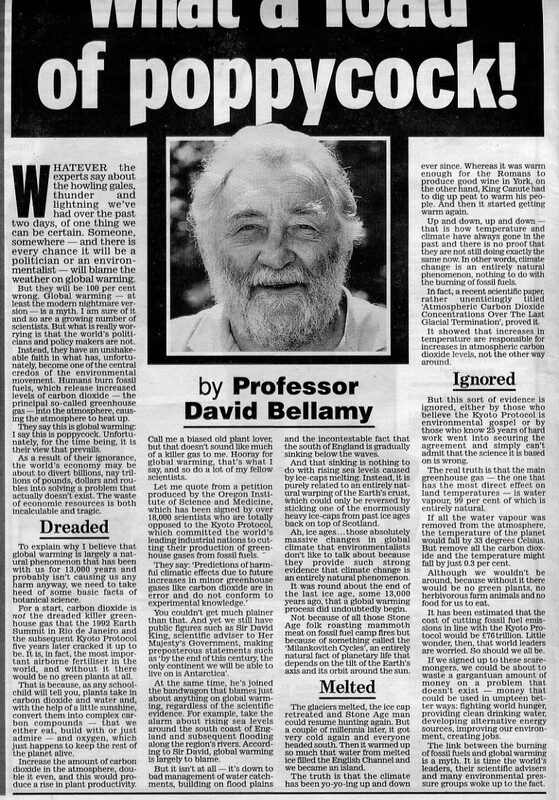 In 2004, David Bellamy wrote an article in the Daily Mail in which he described the theory of human-made global warming as ‘poppycock’. He also expressed his opinions on global warming in other newspapers magazines and scientific journals, particularly between 2005 and 2007. “Honorary Graduates of Bournemouth University” (PDF), Bournemouth University. Document no longer available online. David Hasemyer. “Documents Reveal Fossil Fuel Fingerprints on Contrarian Climate Research,” InsideClimate News, February 21, 2015. Archived December 15, 2015. Google Scholar search for articles containing “Climate” or “Global Warming” by author “David Bellamy.” Search performed October 18, 2017. Boyle, Stewart; Ardill, John (1989), The Greenhouse Effect, London: New English Library. “What a Load of Poppycock!” The Daily Mail. Retrieved from Junksciencearchive.com. Archived .png on file at DeSmog. “16mm sound film “POWER FROM THE WIND” GB 1989” YouTube video uploaded by user “95filmforver,” October 2, 2017. Archived .mp4 on file at DeSmog. The 2008 International Conference on Climate Change: Global Warming is not a crisis! (PDF), Archived July 25, 2015. Archived .pdf on file at DeSmogBlog. “David Bellamy denounces man-made climate change,” 3 News, September 9, 2009. Archived July 22, 2013. Archived .mp4 on file at DeSmog. George Monbiot.”Bellamy the Bearded Bungler doesn't disappoint,” The Guardian, March 16, 2009. On 28th June, the Green Institute featured on a TEDx event titled Shaping The Future, where 12 speakers within 12 minutes spoke on various fields of study spanning across agriculture, music, poetry, social and biological environment. Some of the speakers include Walter Spearheart (multi-instrumentalist), Olushola Amusan (Curators), Professor Theophilus Fadayomi (Acting Vice Chancellor, Elizade University), Tade Ajiboye (Virtual Reality Developer) and others. The event took place in Elizade University, Ilara-Mokin, Akure, Ondo Nigeria. Among the speakers was Dr. Akinsemolu Adenike (Founder of the Green Institute) who was accompanied by a few representatives of the Green institute, where she gave a presentation titled “Selling the Green Idea”. With a time limit of 12 minutes, she gave an orientation about what the Green Institute is involved in, what it means to go green, the need for environmental sustainability and also implored the audience to take the green pledge. She was educated at St. Mary’s School in Nainital, and at the Convent of Jesus and Mary in Dehradun. Also, Shiva read Physics for both bachelor and Masters Degrees at Panjab University in Chandigarh, graduating in 1972 and 1974 respectively. Moreover, she studied for and got an MA in Philosophy of Science at the University of Guelph, Ontario, Canada, in 1977. Furthermore, Shiva studied for and bagged a PhD in Philosophy of Physics at the University of Western Ontario, Canada, in 1978. Finally, she later proceeded for interdisciplinary research in Science, Technology and Environmental Policy at the India Institute of Science and the India Institute of Management, both in Bangalore, India. Thus, Vandana Shiva is a complete and prolific technocrat and a celebrated environmentalist. Though Vandana Shiva is a well-trained and Certificated Pure Scientist, she makes a living as an author of various innovative books on green education and as a conference speaker. Vandana Shiva lives in India. Vandana Shiva is a prolific advocate of women rights and sustainable living. She is also an ever-ready and indefatigable activist of biodiversity and indigenous knowledge. Thus, she founded the Research Foundation for Science, Technology and Ecology (RFSTE) in 1982, which later led to the forming of what is known as “Navdanya” in 1991. Navdanya means ‘Nine seeds’ or ‘New Gift’, which is a means of educating farmers of the immense advantages in the practice of having various and individualized crops rather than receiving offers from mono-culture food producers. The initiative brought about the establishment of over 40 seed banks across India for diversified agriculture. Shiva also set up ‘Bija Vidyapeeth’ which is an international College for sustainable living, in Doon Valley, in 2004. He first book entitled ‘Staying Alive’ was published in 1988 and it helped redefine perceptions of Third World Women. Also, Shiva has written copious reports for FAO and the UN on mainly women rights issues and sustainable agriculture and even manufacturing. Besides, she has worked for the Promotion of biodiversity in agriculture to increase productivity, nutrition and farmer’s incomes. It is for this work that Time magazine recognized her as an ‘Environmental Hero in 2003. In an interview with David Borsamian, Shiva argues that the Seed-Chemical Package promoted by Green revolution agriculture had depleted soil, destroyed living ecosystems, and negatively impacted people’s health. In her work, she cites data allegedly demonstrating that today there are over 1400 pesticides that may enter the food system across the world because only 1% of pesticides sprayed act on the target pest. Vandana Shiva, alongside her sister, Dr Mira Shiva, argues that the health costs of increasing pesticide and fertilizer use range from cancer to kidney failure to heart disease. Also, on what she calls ‘biopiracy’, Shiva has fought against and won attempted patents of several indigenous plants in India, such as basmati by the US Department of Agriculture and the Corporation WR Grace. Moreover, her activitism included the struggles against the promotion of the Sale and consumption of ‘Golden rice’ (a breed of rice that has been genetically engineered to biosynthesize beta-carotene, a precursor of Vitamin A) in India by GMO corporation of India, around 2013. However, there have been several and severe criticisms of Vandana Shiva’s views and methods by some reputed solid analysists notably investigative Journalist Michael Specter of the New Yorker in an article on 25 August, 2014 entitled ‘Seeds of Doubt’ and journalist Kerth Kloor in an article published in ‘Discover’ on 23 October, 2014 entitled ‘The Rich allure of a Peasant Champion. Notwithstanding, all the criticisms have not reduced the personality and achievements of Vandana Shiva as a first-rate, world-class environmentalist. Today is World Migratory Bird day (WMBD)! This tiny migratory pollinator breeds in western Canada and the U.S. It spends the non-breeding season primarily in Mexico, but has also have been increasingly documented as wintering in the southeastern U.S. The Rufous Hummingbird is known as one of the “feistiest” hummingbirds in North America, aggressively defending nectar at feeders and flowers. This species breeds farther north than any other hummingbird, all the way to Alaska. Its migratory pattern is unusual, with most following the Pacific Coast north and the Rocky Mountains south, as one of the earliest fall migrants at backyard feeders. Their declining population may be due to changes in the timing of flowering as temperatures warm, pesticide applications, or loss of habitat. To help these brilliantly colored birds, plant native flowers that bloom throughout the season. Changing habitats are impacting this striking bird with bright yellow markings. The Golden-winged Warbler prefers nesting sites with sparse shrubs and trees in wetlands or in upland areas. As this habitat matures to forest or is developed, numbers of this species have declined steeply. This species usually nests on the ground. Traveling as many as 19,000 miles each year from non-breeding sites in South America to nesting sites in Canada, in as few as six days, it faces challenges throughout its journey. During spring migration this species stops over in Delaware Bay to feed on the eggs of horseshoe crabs. Such sites where they refuel for their long flights are important to protect. One of the biggest contributors to the declines in Red Knot populations is a warming climate, which is reducing the tundra where they nest, intensifying storms during their migration, and warming sea waters which affects the shellfish they need to survive. Helping to protect migratory birds from climate change impacts starts at home. Weatherizing your home, using energy-efficient lights and appliances, and reducing your use of fuel are small steps, but when multiplied across the planet they can have a big impact. President Donald Trump last year pulled the United States out of the agreement, making the country the only one opposed to the pact. Former New York mayor and billionaire Michael Bloomberg said on Sunday he will write a $4.5 million check to cover this year's U.S. financial commitment to the Paris Climate Agreement. President Donald Trump last year pulled the United States out of the pact, making the country the only one opposed to it.